The Kentucky power plant is one of two being closed because the fuel is no longer economical. Struggling supplier Murray Energy, run by a big Trump supporter, reckons overseas markets are its salvation. But they are unlikely to come to the rescue of the American industry. The White House touts reductions in U.S. regulatory costs of $33 bln since the president took office. Yet clean air and water, in particular, bring huge social and financial benefits, including reduced rates of dementia. Saving short-term pennies will cost long-term pounds. The Central Asian nation revived plans to list its prize mine, seven years after it tried at a $15 bln valuation. Coal prices have rebounded from 2015 lows and Chinese demand is strong. With just one big customer and years of false starts, though, investors will need convincing. The EIA says natural gas output from shale in the Appalachian region – traditionally America’s coal heartland – far outgrew other areas. Efficiency gains will further cut gas costs. 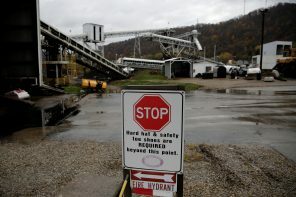 Dirtier miners may lobby for Washington handouts, but the shift is already well under way. An administration plan to subsidize solid fuels has stirred a backlash from industry, which fears distorted power prices. Meanwhile U.S. carbon emissions from coal fell at a record pace in 2015. Environmental and economic forces conspire against the president’s campaign pledge. Trump aims to boost American fuel exports by fostering coal and oil drilling. But the deluge in Texas has disrupted 16 percent of the nation’s refining capacity. Tackling climate change and hardening energy infrastructure should take priority over the president’s pet projects. Yancoal is raising more than 10 times its own market cap to buy Rio Tinto’s coal unit. To get this done, the indebted small-cap had to bring in some unusual underwriters. The result is a novel blend of Australian public-company process and Chinese state capitalism. Angela Merkel has castigated the U.S. President for pulling out of the Paris accord. Yet two German states are putting mining jobs ahead of cutting carbon emissions. If they don’t reconsider, the Chancellor’s green credentials – and the global agreement – will suffer a blow. Rio Tinto still wants to sell $2.5 bln of coal assets to China's Yancoal, rather than taking $100 mln more from the Swiss trader. Worries that Beijing would create problems for the gatecrasher probably played a role. A sharply higher offer could persuade Rio to reconsider. The Anglo-Australian mining giant named Ken MacKenzie as its new chairman. The former manufacturing executive lopped heads and boosted returns at his last job, and was unsentimental about weak business lines. Activist investor Elliott is pleased. Other shareholders should be too. Donald Trump has gifted China the chance to lead the charge against climate change. But the country must conquer a contradiction. Beijing bureaucrats may love cleantech investment, but as economic growth slows, they fear the costs of regulation and restructuring. The trading giant has shoved aside Yancoal's slow-moving purchase of Rio Tinto assets with a $2.6 bln cash bid - $100 mln over Yancoal's still not-quite-financed offer. Glencore is betting Yancoal has thin political support and weak financial firepower. That seems shrewd.